The week will begin with a warm day and slowly descend back into winter, but temperatures will remain above average for several days. Monday’s high will be 49 degrees as morning clouds give way to a sunny afternoon, and things improve on Tuesday with a high of 57 under sunny skies. Wednesday’s forecast high is 44 degrees and Thursday’s high will be 49 degrees. There is no rain in the forecast until Friday afternoon, though the precipitation will bring in more warmth. 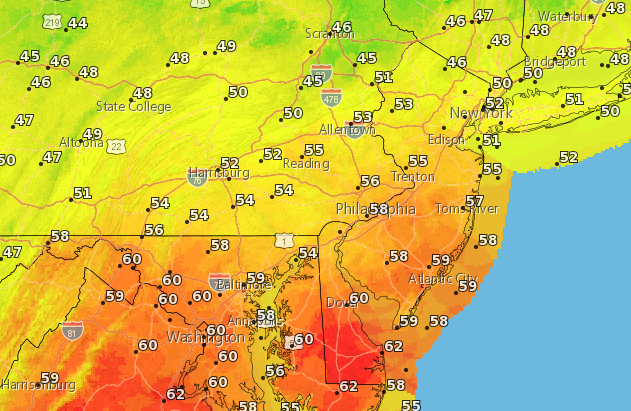 Next Saturday’s high will be 58 degrees and Christmas Eve, Sunday, will have a high near 50, according to the National Weather Service.